In an era where boilerplate military first-person shooters dominate the gaming landscape, Mothergunship is a rare treat. Developed by Grip Digital and Terrible Posture Games, it takes a more arcade-style approach to things. Delivering a bleeding fast bullet-hell gunplay and inventive weapons crafting system, this spiritual successor to 2014’s Tower of Guns doesn’t take itself too seriously. In fact, it forgoes any aspirations for a gripping narrative in favor of pure, unadulterated mayhem. And if you ask me, it’s all the better for it. The paper-thin premise is simple, but it manages to get the job done. 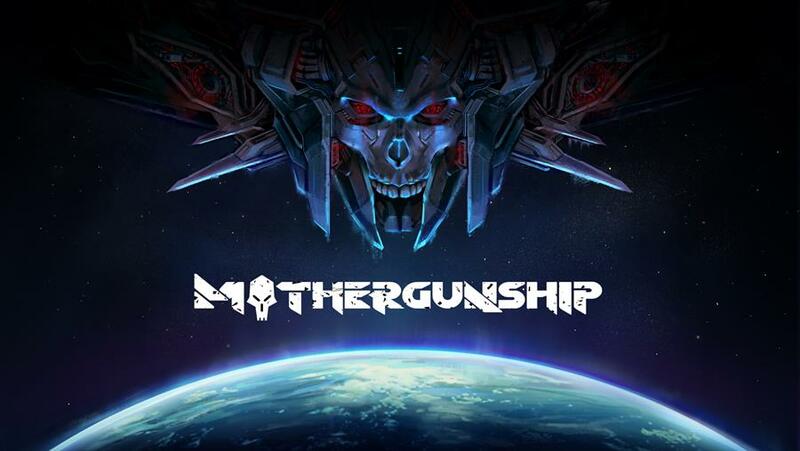 Set ten years after an alien invasion of earth, the game puts players in the shoes of a nameless hero who’s been tasked by the human resistance with tackling an armada of alien vessels to bring down their ultimate target: the Mothergunship. In order to do so, you’ll need to fight your way through dozens of smaller vessels bristling with mechanized monstrosities, gargantuan gun emplacements, and more environmental hazards than you can shake a buzzsaw-lobbing cannon at. Right out the gate, you’ll quickly discover that Mothergunship packs one hell of a challenge. Nearly every room you enter will result in swarms of baddies and bullets hurtling your way. Unless you’re a bona fide bullet-hell Buddha, you’re probably going to die countless times during your first few hours with the game. The key to survival is knowing the best tools for the job. And let me tell you, this game gives you a veritable workshop’s worth of ways to dispatch the metallic menaces you’ll find in Mothergunship. As you complete stages and destroy enemies, you’ll collect gold. Gold can be spent at shops to purchase new barrels, connectors, and caps that will help you craft a dizzying array of armaments. Barrels determine what type of gun you have, connectors are used to mount numerous guns to each arm, and caps augment each gun with special buffs and bonuses to help dish out some extra damage. Sure, you may start out with a crummy blaster that barely scratches your enemy’s paint job. But you’ll eventually become a real force to be reckoned with as you trudge through the stages strapped with six cannons strapped to your frame lobbing a combination of spiked volleyballs, grenades, lasers, and trails of scorching flame. Now that’s one hell of an equalizer! 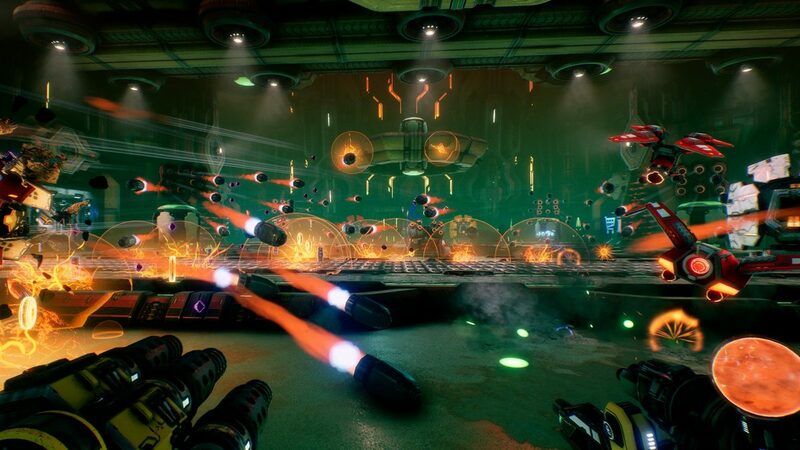 Without a doubt, watching waves of enemies reduced to scrap metal as you sport more guns than the USS Missouri is an awesome feeling and without a doubt the highlight of Mothergunship’s experience. However, things start to fall apart when that freedom is taken away from you. Certain stages will require you to work with pre-defined weapon load-outs. Sure, this sounds like a great way to familiarize the player with the different weapons in the game. However, these missions can prove to be pretty frustrating at times. 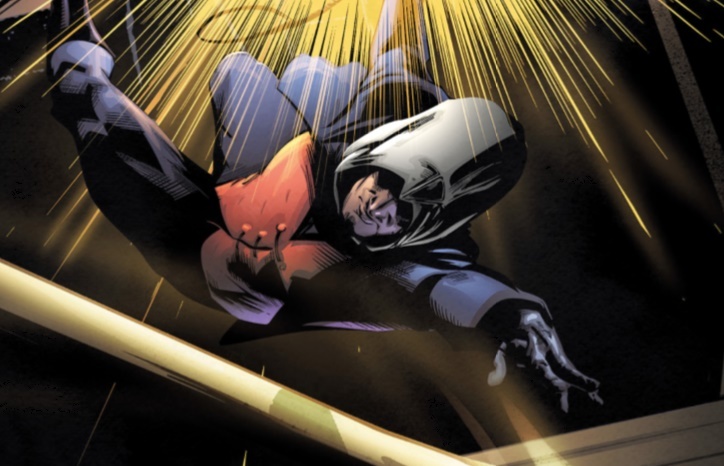 Oftentimes the weapons you’re given are ill-suited for the task at hand. Trust me, trying to take down waves of high-speed drones with a painfully slow railgun and grenade launcher is no fun. In fact, it can be downright infuriating. What’s more bothersome is that the game doesn’t do a very good job of letting you know when you’re taking damage. There were countless times I stumbled into a spike trap or was surrounded by knee-high robots chomping at my shins and couldn’t tell until I was nearly dead. This can be a huge problem, especially when you consider just how much can be happening at any given moment in Mothergunship. Simply put, the game is in desperate need of a better hit indication system. If you’re used to playing roguelike games with randomly generated loot and enemies then some of these issues will probably be easy enough to overlook. Still, I’d be lying if I said there weren’t moments I was tempted to lodge my controller into the drywall. Thankfully, even in death, the experience you earn carries over. And once you return to the hub world, you can use it to upgrade your avatar with some RPG-lite skill points to help level the playing field a bit. These can be spent on increasing the number of jumps you can perform consecutively, your speed, health, energy, and more. Sure, it’s not the deepest system. But it’s a great incentive to knock out those side missions before advancing in the story. 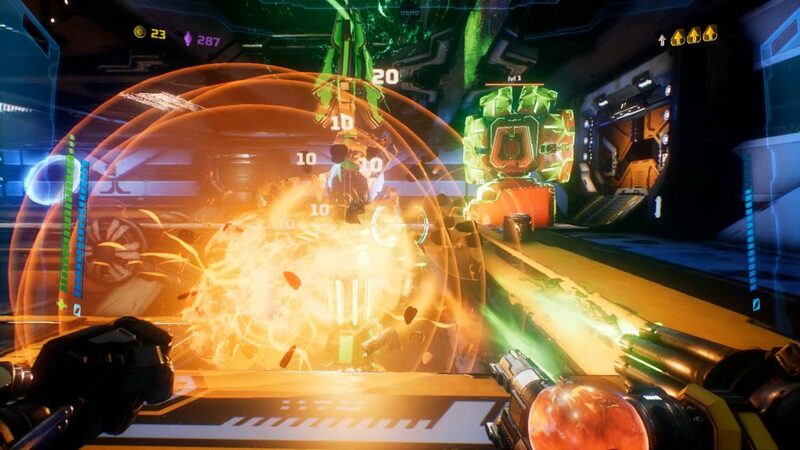 Though not without its moments of frustration, Mothergunship consistently shoots to thrill. Every stage features randomly generated rooms that offer new and exciting challenges to spice things up. Challenge Rooms, for example, test your skills by setting preconditions to completing the room and reward your efforts with cash that can be used in the shops. Dice Rooms, on the other hand, add random environmental hazards like floor spikes and lava to keep you on your toes. Additionally, the game features some incredible boss fights that will leave you sweating bullets as you dodge tidal waves of lead and explosions. These challenges and huge boss battles are fantastic. And the cash you earn from completing them allows you to purchase even zanier, more over-the-top weaponry that will help you bring down even bigger and nastier enemies. It’s an incredibly addicting loop that will keep you glued to your controller for hours on end. 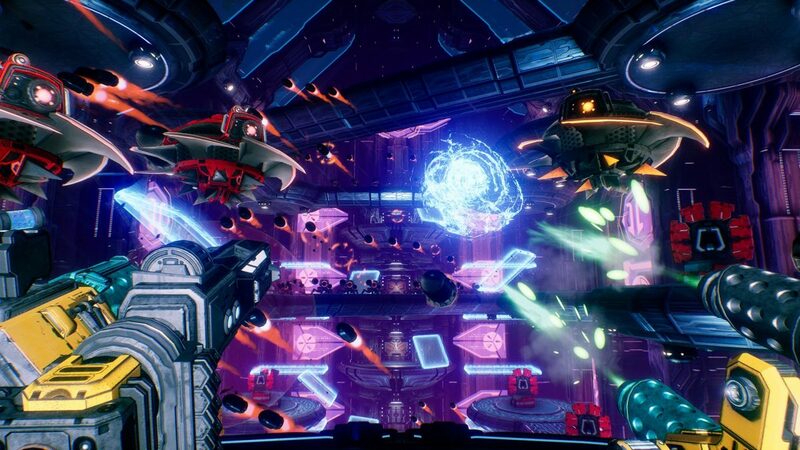 Though not without its lumps, Mothergunship is a satisfying symphony of destruction that will test the skills of even the most seasoned shooter veterans. With a great weapons customization system and titanic boss battles, this bullet-hell FPS breathes new life into the tired shooter genre to deliver an experience that, while not perfect, manages to stand out from the pack. Full disclosure: This review is based on a copy of Mothergunship given to Hey Poor Player by the publisher.